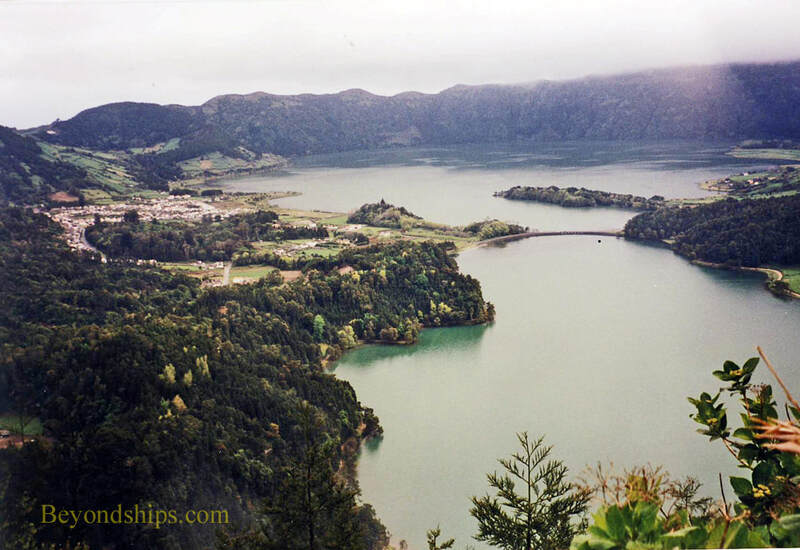 A visit to Sete Cidades is probably the most popular excursion for cruise passengers calling in the Azores. One of the Seven Natural Wonders of Portugal, the appeal of such an excursion is the often spectacular scerery of the countryside. Sete Cidades is a dormant volcano. Although there is vulcanic activity on the island, this volcano last erupted in the 15th century. The caldera is almost circular and has a circumferance of about 12 km. It is about 400 meters deep (1,300 ft).. Inside the crater is verdant countryside with forests lining its steep slopes and two lakes at the center. One of the lakes is blue (Lagoa Azul) and the other is green (Lagoa Verde). Locals explain that the difference in color came about because of an ill-starred romance between a shepard and a princess who fell in love. The king, her father, refused to allow the lovers to marry. The tears of the blue-eyed shepard produced the blue lake. The tears of the green-eyed princess produced the neighboring green lake. An alternative theory is that the difference in color is because the blue lake reflects the sky while the green lake reflects the forests. The difference in color is only visible when the sun is shining. However, the weather does not always co-operate and dense clouds and mist can obsure the view. For a panoramic view, guides take their customers to the Vista do Rei (King’s View) Lookout, named in honor of the Portuguese King D. Carlos and Queen D. Amélia, who visited the Azores in 1901. 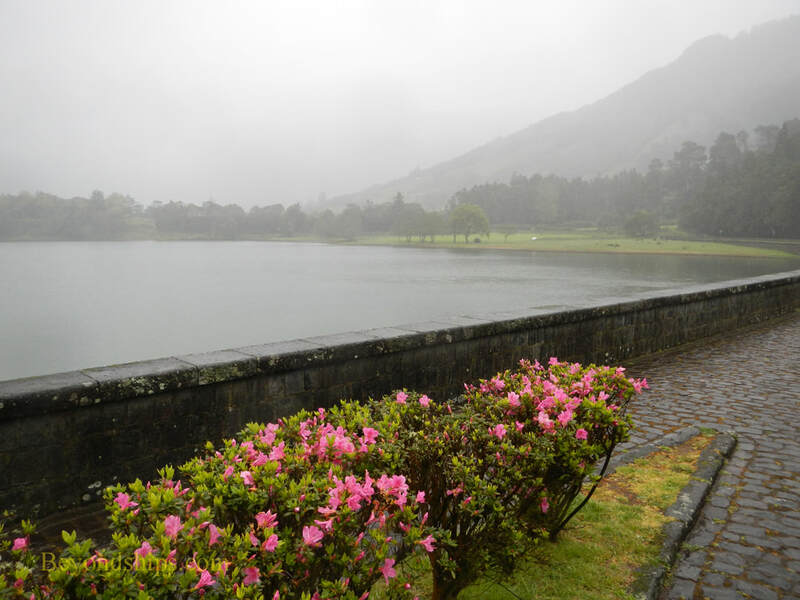 There is a small village by the two lakes, which is also called Sete Cidades. 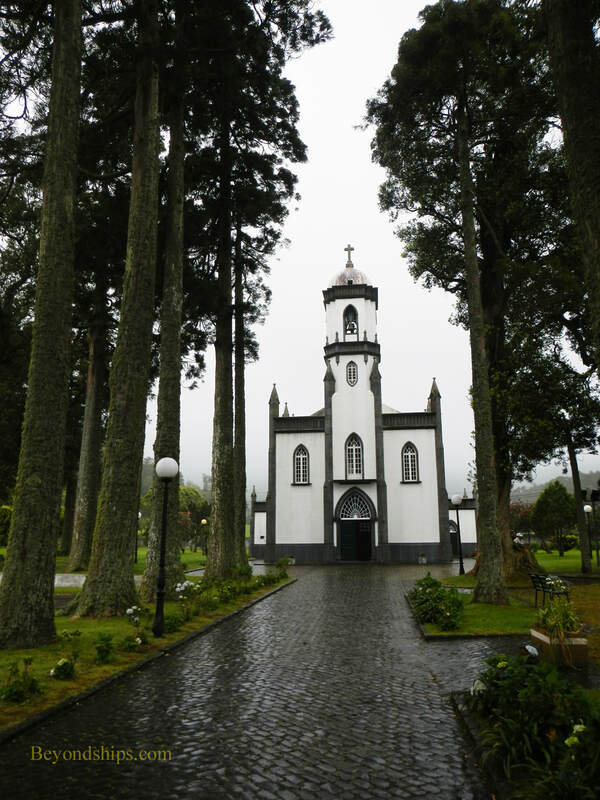 Its main attraction is the pretty Neo-Gothic church Iglesia Sao Nicolau. Above: The Blue Lake from the village of Sete Cidades.